Metal braces have long been the standard for treating bite conditions and correcting unevenly spaced teeth, but an increasing number of teens and adults are discovering the clear advantages of Invisalign. For many teenagers and adults with minor to moderate bite problems or teeth spacing issues, Invisalign offers an effective and comfortable alternative to traditional metal braces. Your consultation with Santa Monica cosmetic dentist Dr. Ana Brightleaf will determine if Invisalign is the best treatment option for your unique needs. Invisalign uses a series of clear, custom-made plastic aligners to progressively shift your teeth into proper position. Each set of aligners fits snugly over your teeth and features minor adjustments to gradually straighten your teeth. You swap out your aligners for a new set approximately every two weeks. Because the aligners are composed of clear, dental-grade plastic and are form-fitting, Invisalign is virtually invisible. Unlike standard metal braces, which feature brackets and wires that can irritate your cheeks, lips and gums, Invisalign is made of smooth plastic and contains no protruding parts. Invisalign also eliminates the need for regular office visits for uncomfortable tightening and adjustments. You change your aligners at home, and your follow-up appointments are limited to approximately every six weeks in order to track your treatment progress. While metal braces come with a long list of foods that are off limits, Invisalign allows you to maintain your regular diet. Although Invisalign aligners must be worn for about 20 to 22 hours per day to achieve results, the aligners are removable for meals and easy cleaning. 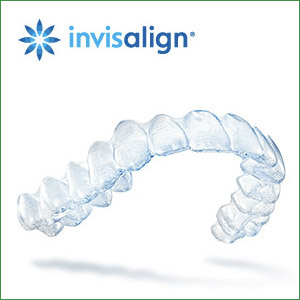 If you would like to learn if Invisalign is right for you, please contact Brightleaf Dental in Santa Monica, to schedule your complimentary consultation with Dr. Ana Brightleaf. We welcome patients from the Santa Monica, Beverly Hills, Pacific Palisades and Brentwood, California, areas.